Learn hardware building and software development with Raspberry Pi Cat: perfect for education and research! Raspberry Pi is a tiny computer developed by Raspberry Pi Foundation, a UK-based educational charity. As of September 2016, more than ten million Raspberry Pis have been sold worldwide. You will learn how to use LINUX, a widely used operating system. You will learn how to build in and network. You can use your own Raspberry Pi (3B, 2B, B+). Raspberry Pi Cat supports several programming languages such as Python, C++ and Java; open-source device driver and code are accessible at the web-based hosting service Github. Compatible with ROS (Robot Operating System), a robot control middleware. Open-source device driver and code accessible at Github. Raspberry Pi Cat runs on ROS ? and can be operated outdoors! 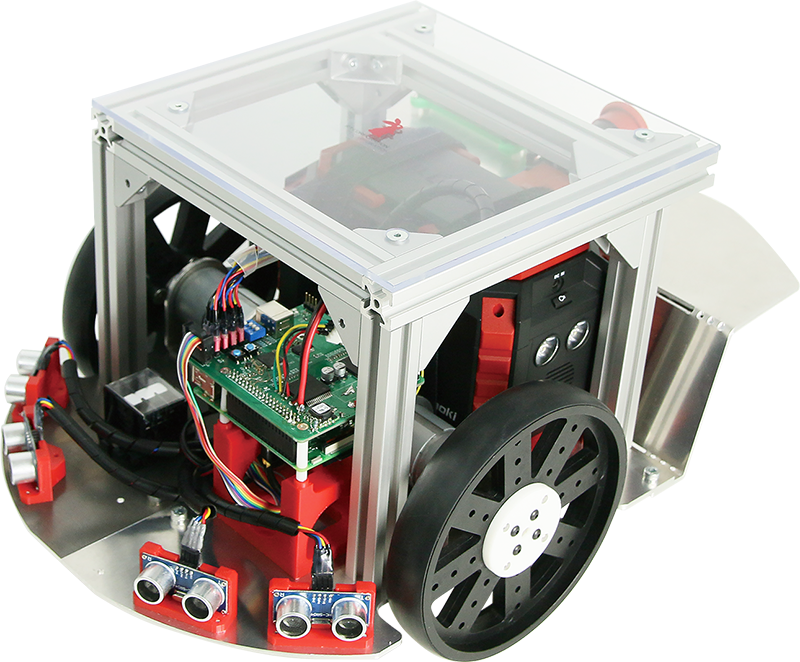 It’s a wheeled mobile robot controlled with Raspberry Pi ? a tiny computer that is just perfect to learn programming. Being a scaled-up version of Raspberry Pi Mouse, Raspberry Pi Cat can be operated with the same device driver as Raspberry Pi Mouse. Also, you may fit your PC on the top of the Raspberry Pi Cat and connect your PC with Raspberry Pi using UART or LAN ? resolving any computing limitations Raspberry Pi may have. *Specifications and price subject to change due to continuous improvements. Laser range scanner URG-04LX-UG01manufactured and sold by Hokuyo can be mounted in the edge. Intel RealSenseD435 can be attached to the body.